I’m really late to this party (what’s new, right? I also just bought my first pair of TOMS…) which is probably why I lucked out and scored these broken-in straight khaki camo pants from Gap for like $18 using a promo code. They’re super comfortable, casual and on sale right now for half the price of these ones from Loft (that’s without using a promo code). The Loft pair are darker but the fit looks great and they’ve got fabulous reviews. The real splurge is this super skinny pair by True Religion. Probably not worth it, but if you’re an avid True Religion wearer, by all means. Other amazing sale styles include this camo cargo pair from Ralph Lauren, these amazing white camo pants by Sanctuary – so summery! – and similar to these True Religion ones (still on sale but way pricier), and lastly these adorable pink camo pants (sounds tacky but they look quite fun) by Joe’s Jeans for the little ladies (or the lucky ones that can squeeze into them). 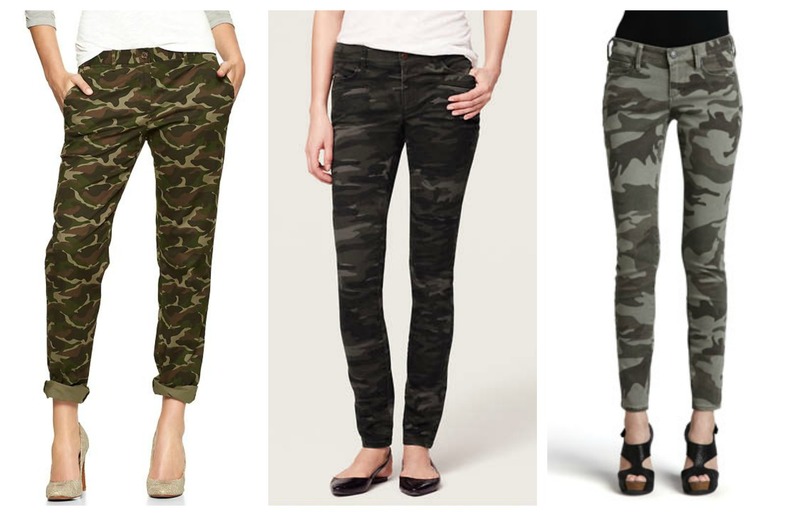 Are you tardy to the camo party with me or so over it already that I should be ashamed of myself?